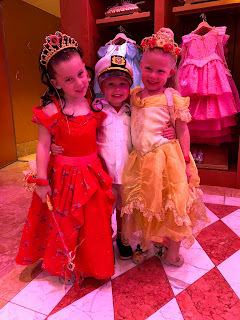 The memories we made on the Disney Wonder... wow! We've talked a lot about this trip and for me, it is one of my most favorite vacations we have ever been on. 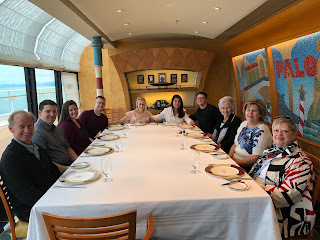 My super generous mother-in-law made this trip happen and honestly, if you have thought about taking a Disney cruise in the past and wondered if it's worth it... it is. For us, with the kids, it was a blast. The Disney hospitality shined and even though I did a non-disney cruise more than a decade ago to Alaska, I didn't appreciate it like I did this time. Alaska has a beautiful itinerary. We went out of Vancouver, Canada (which, if you have kids, they need passports - even 7 month old Cody had one). First and foremost, I love this city. It's beautiful, friendly, and there is so much to do. We didn't even scrape the surface. 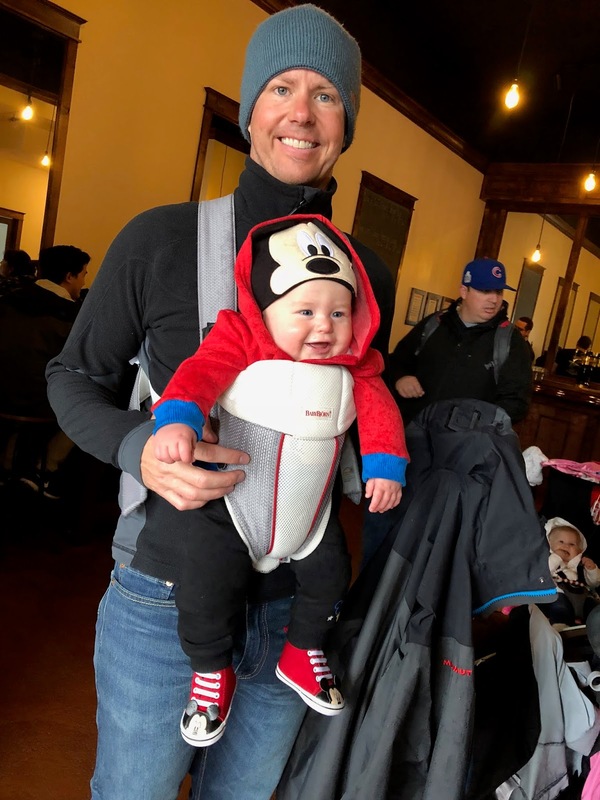 Traveling there with our 3 kids (5, 3, and 7 months) and then my two nieces (4 and almost 1) did make it a different trip, but I wouldn't trade it for anything. Yes, you move a little slower, carry a lot more stuff, and have to work around bedtimes, but it's worth it. You make the most of it! We also had family there to help us through it all, so it was a great experience. What did we do in Vancouver? How did we fly in and get to hotel? Where did we stay? We flew AirCanada non-stop to Vancouver. It was an easy 1.5 hour flight and getting through customs wasn't too bad because they saw we had kids and put us in a different line. We got to the hotel by way of Taxi (we did not bring carseats because it's a lot to pack and researched and was told we didn't need them - and we felt very strange with the kids in the cab for 25 minutes... so beware of that. The SkyTrain is another, probably safer, option for future reference). We stayed at the Marriott Vancouver Pinnacle Hotel and it was very close to Canada Place (where the cruise ship departs from). It's also walking distance to a lot of great areas of the city. It's expensive, so plan accordingly - all of the hotels in the area are. There are AirBNBs and some less expensive hotels just a little further away. You do not need to get Canadian money unless you'd like to. Our credit cards worked with no fees and almost every place (and person) accepted USD. Our first night there, we ate at a delicious restaurant called Joey Bengal One. We ate outside on the patio and they were super accommodating to our large group (including 5 young kids). Our first day we got there pretty late, so by the time we checked in, we cruised around the hotel a bit and then had dinner and dessert. 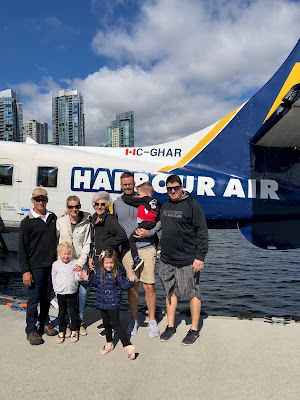 We had one full day to explore the city, and I would say we could have actually had two, but we were so excited to board the ship that it would have also been hard to wait. On our full day, we talked to the concierge and ended up booking a private tour van to take all 15 of us around. You can do the hop-on, hop-off tour, but it's about $50 per person and doesn't run all-day. By the time we worked out the numbers for our party of 15 - we figured out this was about the same price and it gave us all of the flexibility we needed. Our tour guide was also super knowledgeable about the city. We spent some time at Granville Island, and honestly, I could have spent a whole day there. It's super walkable, very cute, and has lots to see and do. The tour took us most of the day. We didn't get out at anymore stops, she drove us around and we saw how beautiful the city was. When we got off, we walked around and visited a few shops. Then, we had dinner at Cactus Club (this is a chain in Vancouver). The food was good and they were super accommodating once again for our large party. The next morning, my dad (who is a small-airplane pilot) wanted to do a Sea Plane ride over the city. Of course, he mentioned it and the kids were thrilled and wanted to go, too. None of us had ever gone, so a group of us went. It was stunning. A beautiful sunny day and it gave me so much joy to watch my dad in the co-pilot seat. The first thing Andie said when we landed was "can we go again!". If you go to the city and can afford to splurge on this, I thought it was worth it. It was especially neat because we saw so much of the city from the car the day before - seeing it from above brought a different perspective. How did you board the ship? Where did you go? How did you get there? We boarded the ship at Canada Place and our hotel was just a few blocks away. Luggage for 15 people (including strollers and small children) would make this walk challenging, so we had a large van drive a few of us with all of the luggage to the port. It backed right in and employees were there to collect the luggage. Disney mails your luggage tags weeks prior to going, so be sure to bring those along. Boarding took a little while because you have to go through customs and their registration area. I would say it took maybe 30-40 minutes. It was easy, though. 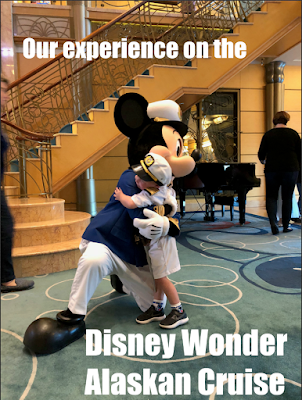 I got a little choked up when we arrived because they had some cruise ship members with big mickey hands on high-fiving us and singing as we arrived. This cruise was something I have always wanted to do and it meant so much that we were getting to experience the magic. I think the cruise line knows this is truly a special thing for a lot of people, so they do their best to make it magical! 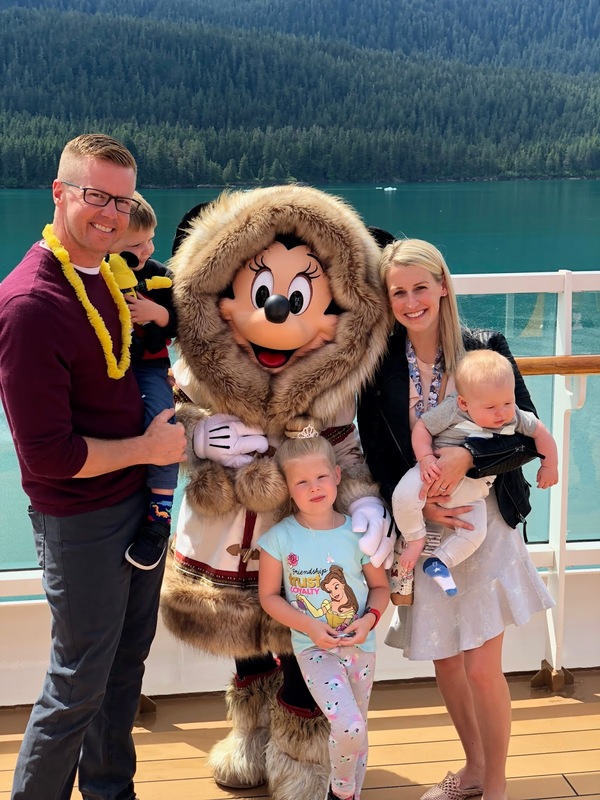 I don't want to give away all of the secrets of Disney, but I will say they do something kind of fun when you walk aboard the ship for the first time. It's exciting and such a fun experience! How did you plan excursions and which ones did you do with the kids? How do you book them? Well, that's the one thing I think Disney has some work to do on. Planning excursions and booking them is all done online before the trip and their website feels like it hasn't been updated or changed since the 90's. It takes a while to book, and especially with a large party, it gets tricky. Have patience and look up the excursions before your time to book them. My mother-in-law actually picked the ones we did and she did a phenomenal job. 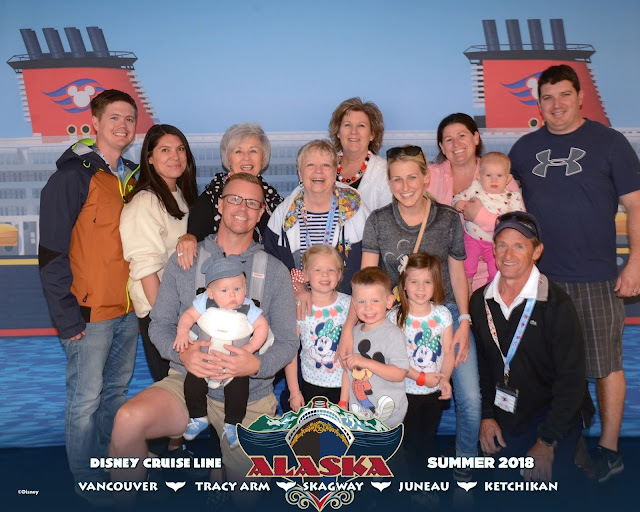 We did the Musher's Dog Sledding adventure in Skagway, The Best of Juneau Tour, and the Duck Tour in Ketchikan. If I had to do with out one, I would say the Duck Tour wasn't all that great. Save your money and just explore on your own. But I have read reviews of so many excursions, so be sure to do your research. Having young kids, we were limited on what we could do, but it all worked out extremely well. I am planning a separate post to share about the Skagway and Juneau adventures so you can learn more! We also did special dining at Palo while on-board the boat. I know it seems crazy to pay for a meal when you are pre-paying for all of your food when you book the trip. But believe me, it was worth it. We had the best waiter, and the food was absolutely amazing. We had a brunch on Glacier day at 10am. The views from the restaurant were stunning and honestly, it was one of my most-favorite meals I have ever had. I think it's about $30 a person, but it's all you can eat - and the food is some of the best you could eat! I, not being sarcastic, took at least 8 trips to the buffet and ordered off the menu. They encourage you to over-order and try it all! Pre-book this especially if you have a party of 4 or more and want to get in on a specific day or time. How was the child care on the ship? Did the kid's spend a lot of time there? Well, the child care area is super amazing! They have it all - themed rooms, slides, character visits, activities galore! It's a dream for kids. My two kids weren't thrilled with the idea about being left alone, so I wouldn't have left them there while we went off of the ship. But, when they were there, they had a great time. Cody did well in the "It's a Small World" nursery and the staff is incredible. I had to go in there to nurse him at one point and I was watching how they interact with the kids... believe me, they're well taken care of! Checking in and getting registered is a little chaotic the first day. Do as much as you can on your online profile before you go and be prepared to wait in a few lines the first couple of days. They are very secure and have a smart bracelet the kids wear that they use to get in and out. When they check in it tells them everything about the kid and who can pick them up, etc. Side note: if you have children under 3, they are required to be in the nursery. The nursery has to be pre-booked before you board. They do have slots once you board that you can try to get, but definitely plan ahead. It costs about $10 per hour, as well, but you book in 30 minute increments. How do you communicate on the ship? Does your cell phone have service? That depends! Our phones had service while we were in port, but whether or not your provider says it's free probably varies. We have Verizon and ours was free anytime we had service (Vancouver and Alaska). My parents have AT&T and theirs was free in Alaska but not Vancouver. In port, we used our phones like normal - but while at sea, they have something in the rooms called "Wave Phones". These act sort of like cell phones and you can carry them around the ship and communicate. We didn't use them much, but it's cool because the child care employees will text your real phone and contact you through the wave phone if they need you or your child is ready to go (which happened a lot). You can purchase internet packages on your phone if you are desperate, but it's not cheap. They also have an app that I strongly recommend you download before your cruise. It's called the Navigator app. This was really fun because we created a massive group text between all of us and we used it to see what everyone was up to and where everyone was. They have really cute Disney Emojis that made it even more fun. The one thing they need to improve is how the app does notifications on your phone. You could only see the messages if you had the app open. So if you were trying to get ahold of someone, you had to hope they opened up their app to check it. Fingers crossed that gets better for future cruises! What extra stuff did you do on-board? Did the kids do anything special? Don't they have deck parties? Yes, yes, and yes. My mother-in-law is awesome and wanted the girls to do the Bippity Boppity Boutique as much as possible... so they did something called the "Castle Package", which was 3 trips to the boutique, and on top of that, they did the "Frozen Package" which meant they got dressed up as a character for the Frozen night. It costs extra (I don't even want to know). But goodness gracious, they enjoyed every. single. minute. Those are some of my favorite memories - so much pure joy and magic. And the lovely ladies in the Boutique knew us all quite well by the end. They treated the girls like royalty. To book the boutique, you need to plan ahead. Pay attention to what days they go and how it interferes with the excursions. With the castle package, it included a suitcase to bring home all of their new costumes and treasures, so plan ahead with that, too! They have a Frozen Deck Party and Pixar Party Night. They also have the Bon Voyage Deck Party and they show lots of movies on board. The one thing I think Disney could improve is the timing of the parties. The Pixar Party was at 4:30 on Juneau day. We barely made it back by 4:30, so we were late by the time we got the kids changed and ready to go. We did get to see most of it and it was ADORABLE. Do not miss it - so many characters, so much magic. 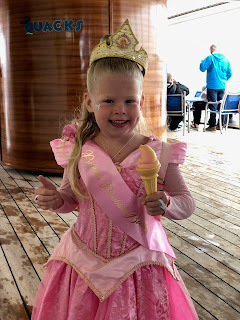 The Frozen Deck Party was good, but not as great. Still worth seeing. But again, the times are crazy - it's around 4pm, and then not again until 10pm - which, my children were toast by that time. But definitely, with out a doubt, do not miss the Frozen Broadway show on-board. The girls were mesmerized by it and us adults thought it was pretty spectacular as well! There are characters everywhere, almost all day long. So don't stress about that. Lines are typically pretty short except for on Glacier Day when they're outside and the views are unreal. Just get there about 20 minutes early and expect a little wait. This also goes along with what I said above... don't try to do it all, just enjoy what you can do! The kids also loved the waterslide on board. There's a height requirement, but it's much shorter than most waterslides here at home (I believe 38 inches). Nolan was able to go and loved it. It doesn't land in a pool, so even if your kid can't swim well, it's worth it. They did that one of the days. I thought they would swim more, but really, there's just so much to do, swimming wasn't really a priority! Oh goodness, this was something I researched heavily before we left and I will say, I way over-packed! My sister, however, said she used almost everything she brought. I am going to make a little list of everything I brought and share it in another post - but to be brief but to the point... pack layers. The weather was beautiful and sunny, and we also had some freezing and windy weather, too! Don't forget sneakers and warmer shoes for cruising around the ship. How formal was formal night? And regular dinners? Honestly, if you book Alaska, don't stress too much about this. We got a little dressed up for formal night, but not everyone did. No one was judging, it is what you want it to be! Most of the other nights, I went with what I was wearing that day. It's casual, comfortable, and just be yourself. Don't worry about trying to fit in with other guests because everyone was so different. I couldn't tell you what the people at the table next to us were wearing. They do rotational dining, which is really neat. There are 3 themed dining rooms and each night you eat at a different place. The staff travels with you and it's fun because the menus are all different and the themes of the dining rooms themselves! You will know where you are eating because of the navigator in your room or you can look at the app and it will tell you. You waiters will also tell you where to be the next night. We had the early seating at 5:15pm. It worked very well with us with young kids, especially. And, we were all hungry by that time. Most of the ports have an early boarding time, so we never really felt like it infringed on our time off the ship, but if you have older kids that can wait for the late seating (I think it's around 7:30 or 8) then it's not a bad thing. What were the Ports of Call? Where was your room on the ship? Did you have a verandah? For our 7 night cruise, we had 2 days at sea, a stop at the Glacier where you don't get off the boat (unless you do the one excursion they offer to get up close with the glacier), and a stop in Juneau, Ketchikan, and Skagway. All of our rooms were in a row on Deck 8. We were forward on the ship and it was fabulous. We were also spoiled to be in the Verandah rooms and oh my goodness, if you can splurge for a room with a Verandah, you won't regret it. 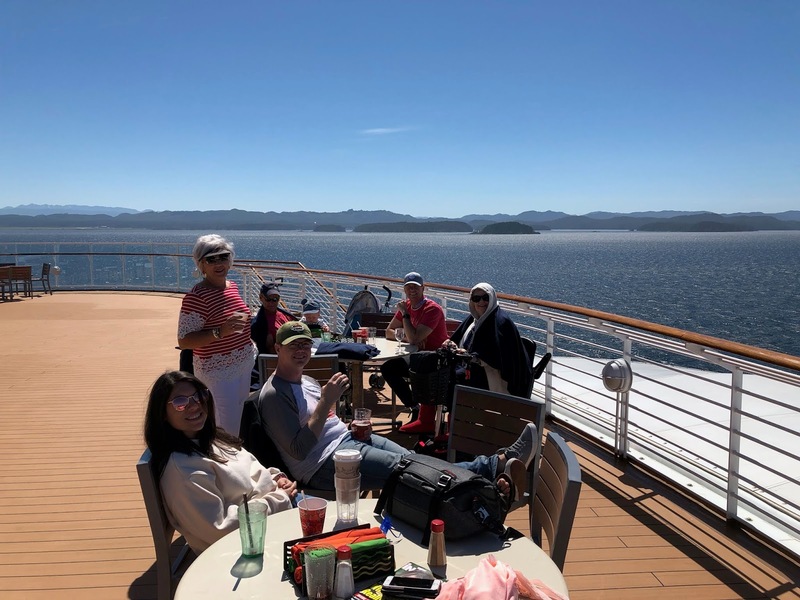 This cruise is close to land almost the entire time and the scenery is GORGEOUS. I kept pinching myself because I couldn't believe it was real. We spent a lot of time on those verandahs and it was nice to be able to hang out if the kids were napping or sleeping! We were in the family size rooms and for the 5 of us it was great. We had two bathrooms - one with a sink and toilet and another with a sink and tub. The baby slept in a pack-n-play (our bed, too) and the kids loved the bunk beds. Was it a rough cruise? This is something I wondered a lot before we left.. and you may, too. The answer is - no. It's not a super rough cruise and I didn't see anyone getting seasick or anything crazy. That being said, you absolutely feel movement on your two days at sea. It's pretty mild and nothing to be afraid of, but bring along the little sea bands (I used them) if you are worried. The worst was at night so we slept through most of it. For the majority of the cruise you can see land (& it is STUNNING) just a few hundred yards off the boat. I never felt far from the land and for the entire 3-4 days of the middle of the trip we never even really felt the boat moving. It was pretty windy for one of our days! What would you do differently next time? Anything you wish you did that you didn't do? Nothing. Honestly, this trip was so jam packed full of amazing experiences. I know we missed out on a lot, too. However, we made it to dinner every night and had the sweetest wait staff (shout out to Maurice and Nichola) and devoured so much delicious food. (PS: they are ridiculously accommodating for kids - including but not limited to: making mickey mouse ears when they put ketchup on their plate, ordering food that isn't on the menu and having it ready for the kids when we arrived, and cutting up their chicken for them). Believe me, the service is top-notch! We also experienced several characters, explored off the ship in the beautiful little ports, and made the most of it all. Maybe next time I would consider ordering room service for breakfast and going to their on-board coffee shop to get special drinks (they do cost extra, though). I would also maybe try to make a few more of the night-time shows (this was challenging with Cody). But my kids were the age they were and experiences are going to vary based on that. My advice: just go in with unknown expectations and enjoy it for what it is for you! Don't stress too much about planning every minute (besides the nursery time for infants, the Bippity Boppity Boutique and your excursions). Also, I don't want to give away anything, but there are little surprises (beyond the towel animals) from your room attendant. Greg, our attendant, was seriously incredible! (I wanted to take him home with me). He made it really special for the kids and there was a few extra surprises we didn't know about that the kids loved! The hardest part of the trip was the day we got off the ship. There is so much unknown when you board, and it's hard not knowing what to expect. But it's not overdone, it's not cheesy. It's fun for adults and kids. The kids were very sad to be leaving, but honestly, I think I was the saddest! I can't wait to go again. It was the trip of a lifetime. So many special memories! Dear Cody... you are 8 months old!